Thanks to your support, we will be publishing a lot more reviews of the old Nikkor classics that we either purchased on auction sites, or loaned from our readers. This is a review of a true classic, the Nikon NIKKOR-H Auto 28mm f/3.5 (Ai modified), which was manufactured way back in 1959. One of our readers, Joe Ridley, was kind enough to send a number of Nikkor classics, and this lens is the first one that we are reviewing. Please note that such reviews of classic lenses will be limited to one page, with a small number of image samples. Still, full lab measurements will be performed on each lens for thorough analysis and comparisons. 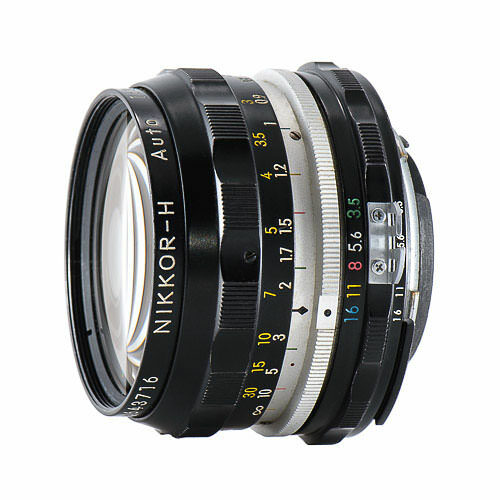 The NIKKOR-H Auto 28mm f/3.5 is one of the earliest, Pre-Ai Nikkor manual focus wide angle lenses for the F mount. Initially launched in 1959, this lens went through several iterations overtime with slightly different optical designs. The lens is available in various auction sites including eBay, but an Ai-converted version is really hard to come by. If you do decide to purchase one, you have to get the lens Ai-converted to properly mount on modern DSLRs. If you do not do this, you risk damaging your DSLR, since the non-Ai version could either break the metering tab / lever on the lens mount, or could get stuck on the mount and potentially cause other damage. If you get an Ai version of the lens, or get it properly converted, it will work on any modern DSLR. On lower-end bodies, metering will not work, but if you have anything above D7000, metering will work just like on any other manual focus lens. I used this lens on both the Nikon D600 and D800E camera bodies and the lens performed perfectly fine. And by the way, if you have the new Nikon Df camera, you do not have to worry about converting lenses – even pre-Ai lenses will mount on the Df. The only thing you will have to do is manually change the aperture on the camera to match the one picked on the lens, since the camera would have no way of knowing it. With a maximum aperture of f/3.5, the lens is obviously not a speed demon. However, despite its maximum aperture of f/3.5, the Nikon 28mm f/3.5 is designed to be very sharp wide open, as you will see below. Sadly, only its center shines in optical performance – due to its rather soft edges, the lens is not well-suited for landscape photography, where edge-to-edge sharpness is often desired. The lens would be a little better on a cropped sensor camera, but the edge performance would again suffer quite a bit, especially on high resolution sensors. Still, this lens was very interesting to evaluate, because it shows the many problems that some of the older lens designs were plagued with. I won’t bore you with specifications here, but if you want to check them out, see the NIKKOR-H Auto 23mm f/3.5 page in our Lens Database. Despite its age, the lens handles very well. The focus ring is very smooth and comes to a hard stop at the minimum focus distance and the infinity focus mark. When focusing, the lens barrel slightly moves forward by about 2-3mm, but it is almost unnoticeable. Changing aperture through the ring on the lens is easy – not too loose or too stuff, with noticeable “clicks” between apertures. The sample I tested was heavily used, with marks on the lens body and even some slight scratches on the glass elements. And yet it still performs great, which shows just how good the Japanese craftsmanship was back in the days. These lenses are literally built to last a lifetime, even with plenty of abuse – something that I unfortunately cannot really say about the modern plastic Nikkor lenses. With 6 elements in 6 groups and a small size, the lens feels relatively light compared to other Nikkor classics. But don’t be fooled to think that there are plastic parts in this lens – the lens is all metal, both inside and outside. It is basically just bare metal and glass. Right off the bat at the maximum aperture of f/3.5, this lens performs incredibly well in the center. Considering that the Nikon 28mm f/3.5 was measured on the high-resolution Nikon D800E, this is very impressive. Unfortunately, due to a severe case of field curvature, performance degrades sharply away from the center, even in the mid-frame. The performance improves very slightly at f/4, and the peak performance is reached at around f/5.6 mark in the center. Unfortunately, mid-frame and corner performance stay below average all the way to f/11 and even then it is not anywhere close to what the center can resolve. For best overall performance, the lens should be stopped down to f/11, as can be seen from the above chart. Overall, the distortion is controlled quite well for a wide angle lens. However, the NIKKOR-H Auto 28mm f/3.5 suffers from a slight “mustache distortion“, which is visible when looking at straight vertical or horizontal lines. Imatest measured barrel distortion at 0.22%, which is not bad. In comparison, the Nikon 28mm f/1.8G has more pronounced barrel distortion at 1.25%. The NIKKOR-H 28mm f/3.5 is a solid lens with an all-metal construction. While its performance is quite good in the center, with peak performance reached at f/5.6, the mid-frame and corners are very weak due to heavy field curvature. The effect of field curvature is so heavy, that the lens requires stopping down to f/11 to get average results throughout the frame. Focusing in the corners can yield sharper results, but it blurs the center and mid-frame severely. Hence, unless only center sharpness is desired, this is not a good candidate for modern digital cameras. If you want a good wide-angle lens for your DSLR, the Nikon 28mm f/1.8G (see our in-depth review) would be a much better choice. For this comparison, it seems that the 28mm/1.8G actually -is- quite stellar.., well, if you set it to the same aperture. At f/3.5, the 28mm is almost exactly as sharp as this lens in the center (and much sharper throughout); simply, it has the additional option of brighter settings, which dulls sharpness. But aperture for aperture, there the 28/1.8 beats the 28/3.5 on sides and middle, and matches it in the center. Assuming one can handle the $650 for the 28/1.8G, then the 28/3.5 Ai is not a good candidate, even for the middle resolution. On the other hand, the 28/3.5 Ai could be a “lensbaby” kind of lens, and is probably found used for about a $100 dollars, if one doesn’t wish to blur edges in photoshop. Yes, you are right – the 28mm f/1.8G is actually a very good lens when compared to older classics. The old one is a great lens for those that shoot film or want some creative photography at cheap. Just wanted to thank you for reviewing some of the older lenses. With the Df coming out I am sure more people will be wanting to try out the older lenses. These reviews also might help those that want to try film with the older cameras too. Thanks again. You are most welcome Art! Absolutely love reviews of lenses older than I am :) Thank you. I think this series will really add value to the site. Well done. Thanks for reviewing these obscure lenses. Can you put the imatest scores for the 28mm f1.8 and the 24-70mm on this same page for comparison? I flipped back to these to verify, but I think it would be more useful and complete to have these side-by-side. I think these reviews are very useful. I think they are the only scientific tests of these old lenses on the web. Even Dxomark has not done these. Also, the article should refrence the new ability to mount these in the Df. I think that many people will be motivated to explore these lenses once this camera is out. Chris, thank you for your feedback! 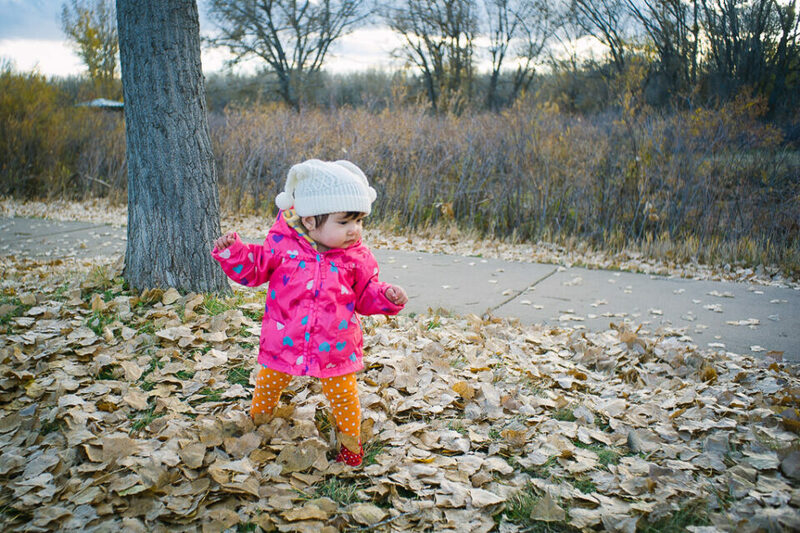 Just added a paragraph on the Nikon Df and will add info from the Nikon 28mm f/1.8G shortly. Very good review on this old lens, I hope you can do another review on the classic Nikkor SC f1.2 55mm lens, the cheaper version of the f1.2 which we can afford. Chris, I will see if I can find one that is reasonably priced and do a comparison. Actually, I bought a Nikkor 55mm f1.2 SC non Ai two years ago for $300- in good condition, I converted it to Ai by myself, I find the quality and performance is very good using my D600. I still want to see more professional comments of it. I did see some, but they are too commercial. Of course, the 58mm f1.2 is one of the best by Nikon, market value is too high. The reason optical performance outside the central area is not so good on the tested digital cameras can also be because of the very small rear element causing steep ray angles reaching the full frame sensor. It would actually be interesting if you retested this lens with the 16MP sensor to see if the larger pixels improved performance. 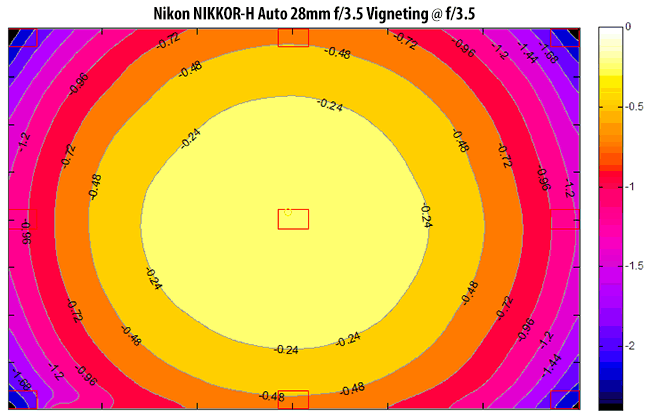 Could be interesting for those who consider buying the Nikon Df camera. As that camera so to speak is geared for use with older Nikkor lenses. You are probably right! The rear element is indeed very small. I doubt you will see much difference in a 16 MP sensor with the lens – perhaps with DX / cropped sensor cameras, but not with FX. Early test with adapted M mount wide angle rangefinder lenses on Sony A7 and A7R show that the 36 MP A7R perform worse than the 24 MP A7. Therefore I conclude a 16 MP sensor could be even better. The problem is of course less on Nikon as the distance from mount to sensor is much longer than on the Leica M mount. But with this lens, because of its small rear element (The smallest of all Nikon F mount lenses what i know! ), testing it with a 16 MP sensor compared to 24 MP could make a difference. Bjørn Rørslett gave the second optical version of this lens quite good remarks for 12 MP DX and FX sensors on his Nikon lens survey page, but haven’t updated the results with newer cameras. Thank you for the terrific test. 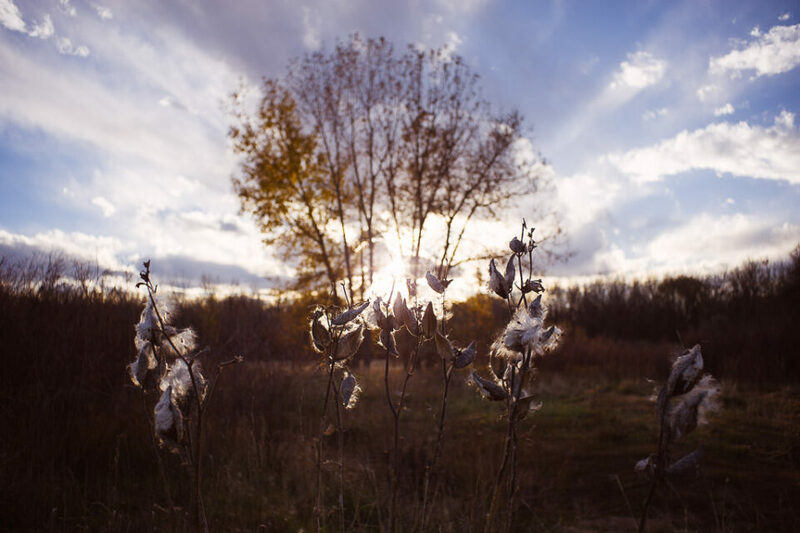 The 28mm f2.8 ais lens with floating element is an excellent lens that never made it to autofocus versions. I think that that one is a good substitute for the older 3.5 one. Daniel, I am pretty sure I have that lens – stay tuned for a review like this one! 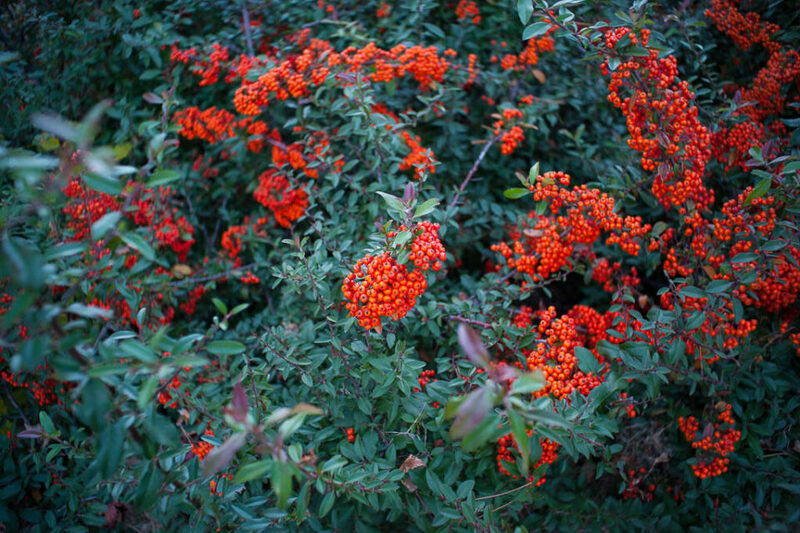 Great that you are reviewing a few of these old pieces, but I think maybe you miss the point of an old lens like this: all that less than perfect performance makes for a certain kind of photographic character – the shot of the red berries on the foliage has an almost 3d look because of it! It looks PHOTOGRAPHIC. So does that shot of the youngster. We pay buckets for plugins and filters that do this to our over sharpened perfect files, no ? That’s what Instagram is all about. Clean is sterile. Fred, you are right – these old classics do not shine in optical quality, but they have their unique characteristics, with the combination of optical formula and beautiful natural vignetting. Great review. I love the pictures especially; this lens seems to have a great, mysterious character. I would never have considered an older 3.5 prime now, but this has me very intrigued. I wonder if you or your readers know if any of the wider 3.5 primes have similar performance (sharp in the middle, not-so-much elsewhere). I have the 28mm f/2.8 AI-S, but am curious about the 20mm or 24mm to compliment. Thanks for this review; generally I love your work, but this awesome even by your usual standards. You should probably take a look at post-close range correction (CRC) wide-angles, basically from the late 1960s on. I can tell you my 1992 model 24mm AF-N handily beats this 28 in the outer field, when used on the D800; in fact, it seems to do better on the D800 than it did on the D7000 or D200. I suspect the D800 low-pass filter and microlenses have probably been designed more thoughtfully for old lenses than some of the DX stuff, so pairing stuff from the 1970s and 1980s with the D800 will likely yield results closer to the new f1.8 than this old f3.5. Others that would be useful for a look would be the 28/2.8 AIS (not the mushy 5-element E, rather the eight-element one), 20/4, 20/3.5, 20/2.8, 24/2, 28/2 and certain 35mm lenses. On a slghtly different note, a lot of news photographers a decade or so ago really liked Sigma’s 14/2.8, which worked out to about a 21 or 21.5 equivalent on the D1, an arrangement that hit a rightly popular angle of view and cropped out all the softness on the edge of that particular lens. It’s still easily the cheapest way of getting to a 90-degree field of view and f2.8 on Nikon DX . . I wonder how it holds up with today’s sensors. DB, thank you for your feedback! You are right, some of the newer versions surely do outperform this classic. However, as one of the readers pointed out, these old classics weren’t about top notch optical performance :) For modern cameras, the newer versions of the Ai-S lenses would be a much better fit! As for the Sigma, would love to give that lens a try sometime. So many great lenses out there! A few important things I’d like to mention about this lens (which I too own). 1 Its very small! A major bonus if you like hiking and climbing things and packing a few lenses. 2. Its Incredible for Canon DSLR Video work! Truly stunning! And its wide-ish angle is great for my cropped sensor and also my full frame sensor! I know of people who even use these old Nikkors on the RED EPIC! And they are super cheap for the quality of optic! 3. There is something magical that happens inside these old Nikkors! There is a wonderful look that comes out of them that is different than the newer lenses. Not necessarily better – but equally beautiful in their own way. Marc, thank you for your valuable feedback and addition to the review! I use it on a D5000 & a D40 and it is not Ai converted. A Df is not the only body that can use non-ai lenses. But you must determine in advance if yours can. My favorite performer in a 28mm Nikon is the f2.0. I would like to see that one reviewed. But it’s not all about charts and this little 3.5 is quite a nice lens. Samantha, just sent you an email regarding this. I own the AI modified version and the orginal Pre-AI for my Nikkormat fim cameras. the 2,0/28 or the “primus inter pares” Nikkor 2,8/28 with it´s amazing performance ! I like to use the Nikkor 3,5/28 because it is small and build like a tank. If you take pictures outside in bright sunlight at apparature 8 or 11 you get verry good results ! The lens you show does not date to 1959. I have an early one that has a chrome front ring with details engraved and filled with black. It also states 2.8cm f3.5. These lenses were coated with a single layer of Flourite. Later ones, with black front ring are multicoated. They often have a C in the nomenclature, I.e. HC. What makes this (and a few others in it’s family) so good, is the element-to-group layout. Thus here we see 6 elements in 6 groups. I use mine on a regular basis and, although cosmetically ‘rough’ it performs just fine. I use it, and others, on Nikon F cameras with Weston meters. No batteries anywhere. Digital? You can keep it! It’s a fantastic lens that I use for field work when shooting structure fires or other emergency operations in bad weather when I’m not to keep on getting the new stuff soaked. Wo-ho-hooo this happens when the field hits the labs ! about when you are satisfied with the real world pictures ? As a student I collect all my money to buy a brand new Nikon F3 HP. It need to be that camera so I have only few coins to afford a lens for it. This was a well used Nikkor E 1,8/50mm plastic fantastic ! A guy walks along and lought about this while I take my first pictures. Some portraits of my younger sister after her convalescense from cancer. Her hair were just grown again a little after the chemo therapy. would have been better even if I used a more expensive lens……..
Just as a heads-up, I own the same very early version that Toby Madrigal above has. It is fine as a pre-AI lens, but on this early version the mounting bayonet is attached without visible screws, and it is officially considered “non convertible” to AI. I have milled the aperture rings on a couple of pre-AI lenses to good effect, but I would not attempt this one, as some serious unscrewing must be done to get the aperture ring off. By the way, I forgot to mention that certain serial numbers of the pre-AI 28/3.5 are listed as incompatible with the Nikon F4. The F4 is notable for being able to work with almost any lens. It is not specified exactly why this problem exists, but as far as I can find out, some versions of this lens had a longer skirt than even standard pre-AI lenses, and present a clearance problem, but I have not seen one to figure out how the problem occurs or what to do about it, or even for sure whether I’ve identified the problem correctly. My earlier 311691 version is not listed, and seems to fit anything that takes a pre-AI lens, so I’m left uncertain what the problem really is or what the solution might be, but you should be cautious, as some of those old lenses went through numerous small changes and success with one may not guarantee success with another that looks like it. I bought one (Ai’d) from Cameta a few years ago, and reading your review help me to finally understand why the pictures taked with this lens have such a distinct look. Thanks for your review. I owe the 28/3,5 in its latest Non-AI version, and I can confirm your results: Quite sharp in the centre, but to the borders it gets disappointing. There are definitively better lenses than this one, even from the sixties. But if you ever should use this 28/3,5 for infrared photography on an APS camera, then you know what a perfect lens is! OK, I exaggerate a bit, but this lens is the best one below 50mm for infrared which I’ve ever tried. It is surprisingly sharp here, even thought it never was made for infrared; retricted to the APS sensor size its border weakness doesn’t matter a lot, and it is completely free of hotspots (a common infrared nuisance) at all apertures. Is there a way to date or figure out which version I have of this lens? It does not have the chrome ring, but the black. Serial number is 689004. However it only says Nikkor H, not HC. Is it the earlier or later version? Thanks. you can mouse over the small illustrations and magnify them. It looks as if yours is from somewhere between 1968 and 72. It would appear to be similar to the other pre-AI versions, but convertible to AI, either with milling or a kit if that still exists. Thank you for reviewing and testing these old lenses. I have a few of them and use them on a Nikon F2 Photomic after my Nikkormat FTN bit the dust a couple of years back. They are quite heavy compared to modern digital gear. However, I just feel that I’ve spent my money wisely when I add another one to my collection. There is an unmistakeable feel and sense of quality about them. You can imagine the top guys from 1960-1977 (when the rubber grips came in with AI lenses) buying and using these all metal lenses. National Geographic guys, Magnum Photo Agency that didn’t use Leica or Contax.